This H&M leather skirt will work for the office and you can wear it off-duty, too. For some people, buying workwear is the bane of their life. It can be annoying, spending money on a piece of clothing that will remind you of the office every time you look at it. I am actually all for compartmentalising my looks; I like the idea of having a work wardrobe separate from my 'free time' wardrobe. In my life, though, my wardrobes are interchangeable. Today, at work, I'm wearing a black midi skirt, cream oversized jumper and white runners - and I'd wear it on a Saturday out and about, too. 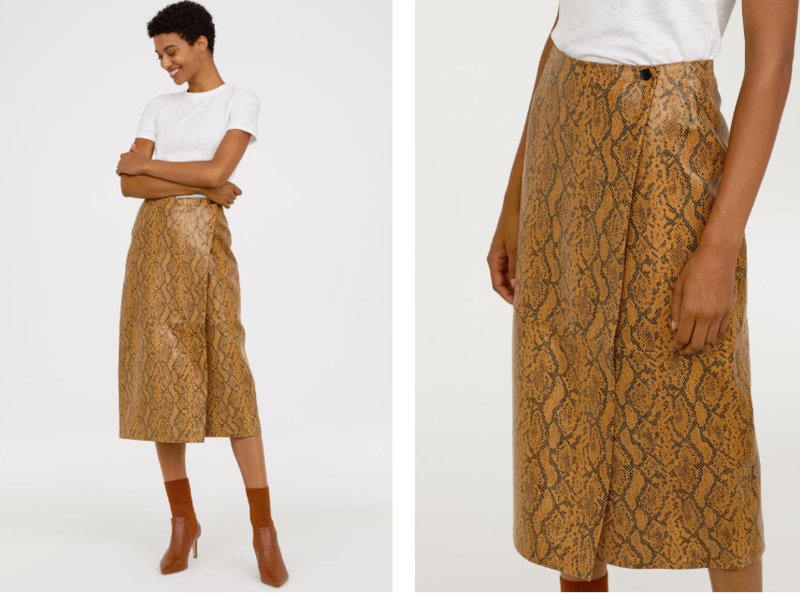 But if the sartorial line between your work and play aren't as blurred, this H&M leather skirt could be the best thing you buy this spring. What I like about it most is that it looks oh, so premium (although it would want to for its €159 price tag). But it looks like it could cost a lot more. There's a hint of the Ralph Lauren about it, and even though it's print is snakeskin, which is very now, it also has classic potential. I can see these being a forever piece that you can rework into your wardrobe many times over the coming years. What's great about a premium-looking piece like this is that it does all the talking. You can wear the plainest of tops and footwear and will still look completely 'put together'. For spring, wear with court shoes and a white shirt. But when its cold, put on those tights and knee-high tan boots and a chunky turtleneck for a retro, chic feel. The skirt is not available in stores, but there were plenty of them in most sizes when I checked. One is in my basket already. Wil it be in yours?